I promised stats (well, I promised to have them yesterday, so bad on me) for these ladies and gents, so here they are! Star mothers are huge, 5-armed starfish-like creatures. They are capable of planeshifting once per week, and use this ability to invade new domains. A star mother is surrounded by a 60-ft. radius aura that has the same effect as the eyebite spell. Starlings are the tiny offspring of the star mother. They look like 5-armed starfish with transparent flesh (acts as natural improved invisibility). They rarely enter combat, preferring instead to sneak up on victims while they are sleeping. They then attach themselves to a spot just beneath the base of the neck, and easily hidden by clothing, and use their magical powers to dominate their victims (per dominate person as a 6th level spellcaster). The dominate ability requires the monster to be in contact with its target. Star lords are 11-armed asterions who serve as the commanders of the star warriors. Their multifaceted central eyes can fire off all the various rays common to the star warriors, each once per day. They can levitate at will. The cosmos of Nod hides many dangers, none greater than the Star Lords, a race of star-shaped creatures who roam from planet to planet in search of slaves and survival. The Star Lords, or Astarions, have no conception of danger, and thus fear nothing. It is said they once attempted to conquer Hell, seeing its demons and devils as no more fearsome than one might a peasant or fat merchant. Of the astarions, there are four sorts which share a deep kinship and which always work in concert to achieve their aims. When they enter a new dimension, the first to be seen is the Star Mother. Her brood, the Starlings, soon appear and carry out their purpose of conquering the minds of whatever creature calls the dimension home. Some of these starlings manage to pervert the chemistries of their hosts, turning them into the dread Star Warriors, and a few of these Star Warriors manage to morph into the dreaded Star Lords, who rule dimensions until they are drained of resources. A star mother is a huge being that looks like a massive sea star, with black, coarse flesh and a pink underbelly. It lies, splayed out in a cool cavern, it’s great bulging eye atop its body, its legs flexed that it might deposit hundreds of small, translucent eggs on the ground. These eggs hatch in a few days, producing starlings. Star mothers are powerful combatants due to their size and flexibility. Starlings are tiny creatures that resemble transparent sea stars. They are, of course, quite sneaky and stealthy, and it is their purpose to leave their mother’s nest and seek out sentient beings. Waiting until they sleep (usually), they attach themselves to their chosen victim’s back, at the base of their neck. From this point, they use their powers to bend the person to their will, pressing them to visit the cave, gather other starlings, and distribute them among other folk, especially folk known to be powerful, influential or capable of entering places in secret (i.e. thieves and assassins). About 1 in 6 starlings is capable of slowly changing their hosts into star warriors. 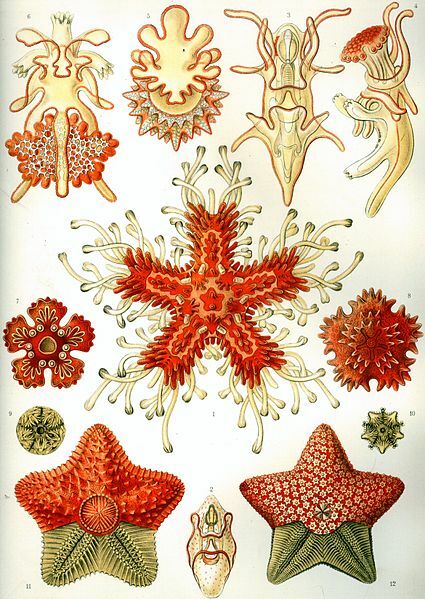 Star warriors are medium-sized creatures that appear as sea stars with coral flesh and large eyes in their center. These eyes are various colors, each corresponding to a different type of ray which the monster can use a limited number of times per day. Star warriors are covered in a sort of chitin, and they are capable of flight. A rare star warrior is destined to grow to large size. Its flesh becomes a deep crimson, and its eye becomes multifaceted, allowing it to use a variety of rays. Star Lords are the rulers of their people, and gain mental control over any humanoid controlled by one of its brother starlings. Star lords command their slaves (whether controlled or merely cowed) to offer up all manner of resources, ceasing the raising of new crops or mining of new materials, and instead directing all effort towards the aggrandizement of the Astarions. When the resources are depleted, the Astarions move on, their star mother shifting into a new dimension / planet / world while its old children simply cease to be, drying into dust and blowing away. A little experiment tonight – I’m going to work up the skeleton of an adventure using the “random file” function at Wikimedia Commons. Now, you can’t do anything with some of these random files, so I’m going to take every single one in turn, but I’ll do my best with most of them to fit them into the scheme of the thing. Every good dungeon needs an entrance. 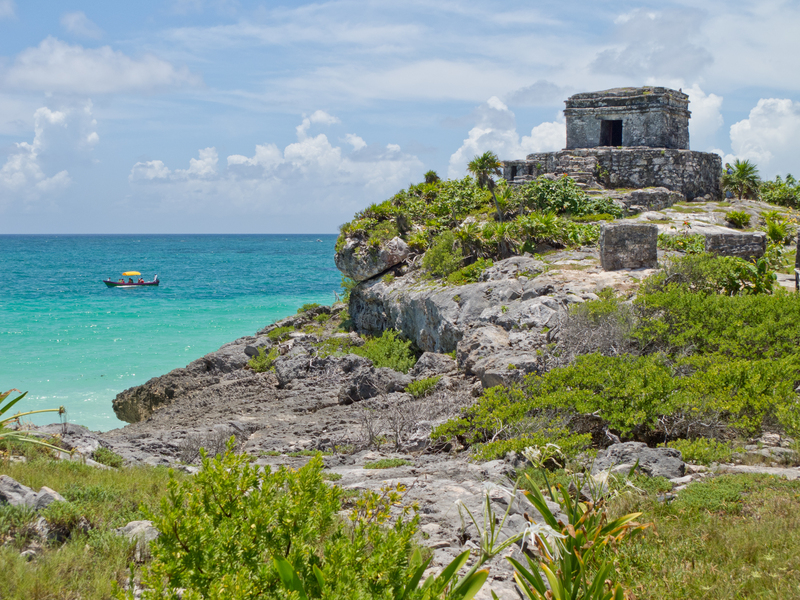 My first image is actually a cheat – I’m using the picture of the day, the Temple of the God Wind in a Mayan ruin. Since I’m thinking more in terms of a short adventure than a mega-dungeon, it’s nice to have some monster or NPC sitting on top of the food chain. Not only is he/she/it the ultimate challenge of the place, knowing their identity in advance let’s you weave their presence throughout the place. My random file – Barack Obama. I’d love to expand on this, but I like to keep politics out of this site, so I’ll try again. The next file is EZ Tondo – some sort of German store I suppose. The image doesn’t help, but how about an exiled Teutonic Knight who dabbled in black magic and has now taken up residence in the bowels of this pagan temple, adopting the identity of Tondo, Son of the God Wind, and cowing the locals into serving him. Tondo will be a 4th level fighter and 6th level anti-cleric (dual-classing, dontcha know), and always accompanied by four of the aforementioned wind priests (2 HD each). Now we need a reason for the adventurers to delve in the place, beyond simple loot. I get “Cathagenian ruins in Tunisia”, which brings Hannibal to mind, of course, and elephants, and thus a figurine of wondrous power, a pretty spiffy relic to delve for. Just within the entrance, we need some wondrous challenge to whet the players’ appetites. I randomly get an image of an altar in a church. Our first great challenge, then, is a trapped altar dedicated to the God Wind. Maybe it looks like a pipe organ. You have to play the proper tune to open the doors into the dungeon, with each mistake summoning a monster or bolt of lightning or gust of razor-wind – something like that. The notes are secreted within a bas-relief of a gaggle of sylphs with open mouths, as though singing or shrieking, the mouths being at different heights and thus corresponding to musical notes. No, the ancient Mayans did not use this sort of musical notation, but since the players probably are not ancient Mayans, the concept works for them. Honestly, I have no idea. But it does give me some inspiration – I’m picturing a person grabbed by legs and arms and pulled in a most inconvenient way. But how? Perhaps a well lined with hundreds of manacles embedded in the walls. The way to descend would be to either climb down a rope or climb down using the manacles as hand- and footholds. Naturally, the things are animated, and at some point attempt to clamp down on people’s wrists and ankles (Reflex save to avoid). Maybe they then pull the person, or maybe they just hold them while some winged goblins fly up from the darkness and attack. Either way, it would make for an interesting and challenging combat. We need a mystery on the lower level to keep the player’s guessing. 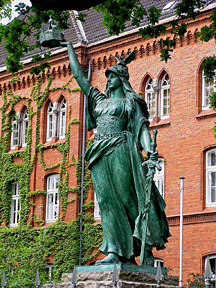 I now get the image of a statue holding a sword and a torch or oil lamp of some kind. This we’ll place in a circular room at the meeting of four passages. The passages lead to outer portions of the lower level – your basic rooms with monsters and traps and scant treasure. By lighting the statue’s lamp, though, and rotating it so that the light falls on bare walls in the rotunda, it also reveals extra-dimensional passages to four sub-levels, each dangerous. Once one walks through one of these openings, they see a wall behind them, so escaping from the sub-levels will be one of the challenges of the dungeon. One of the sub-levels hides a tiger’s eye gemstone that, when affixed to one of the the statue’s eye sockets (the empty one), animates it. It retains its perch and fights like a devil, but if defeated, the pedestal it stands on fades away, revealing a spiral stair that leads to the inner sanctum of Tondo. So, six images gives us the framework for a (hopefully) entertaining dungeon. We would now need to draw up the levels and sub-levels and stock the chambers with monsters, traps and treasure. Remember, random isn’t just good in a game, it’s also good for creating a game – random inspirations to set your little grey cells to firing and creating things even you could never have known were lurking in you campaign world. Today, I thought I’d throw out some of my notions on the colonists who are settling in the Virgin Woode. I like, if possible, to relate things back to classic D&D tropes and concepts – in the vein of “D&D is always right” – and thus pair a bit of historic fact or fancy with the reality suggested by the rules. Recently, I’ve been reading Albion’s Seed: Four British Folkways in America to get some ideas, and it’s certainly been a great help. Currently, the three main groups of colonists are the Pilgrims, Cavaliers and Traders, with a sub-group of Agitators. 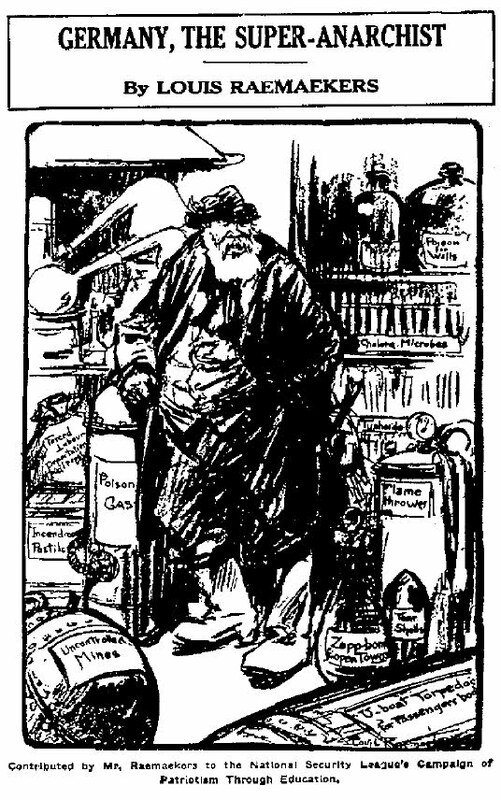 The Traders: You’ll recall “trader” as a monster type in Basic D&D (or Expert – one of them). Here, it refers to venturers (a’ la the class I worked up in an early issue of NOD), rangers and their ilk who settled the Dweomer Bay seeking riches in the Virgin Woode. The “traders” are made up of folks from Antigoon (i.e. Holland), Tremayne (i.e. Elizabethan England), Lyonesse (medieval France), Blackpoort (Dickensian London) and, well, just about anywhere there are men and women who want it all and want it now. The patron deity of Dweomer Bay is Atlas, the “god of exploration”, who has a pretty level-headed and casual cult in the city. The other gods and goddesses of the Motherlands pantheon are here as well, of course. I want Dweomer Bay to be a sort of melting pot of alignments, nationalities, classes, races, etc – like a D&D tavern writ large. Ultimately, an easy place to start a band of adventurers out. A peg-legged old fighting-man will probably serve as the city-state’s elected prince. The Pilgrims: Inspired by the “monster” in the AD&D Monster Manual, the pilgrims in this case refer to religious exiles from Tremayne. Tremayne is ruled by the Faerie Queen, Gloriana, and has as its patron deity Diana. I wanted Tremayne to have a druidic religion that was very formal and, well, “Church of England”, I suppose. The pilgrims are the religious folks who want a return to the more “primitive church”, and they’ve settled to the north of Dweomer Bay in a town called Trinity after the notion of the triple goddess. For all intents and purposes, these folks are pagan puritans, witches who hunt clerics (and demons and such – hey, even if you’re neutral, you know that Chaotic Evil represents more of a threat than Lawful Good). 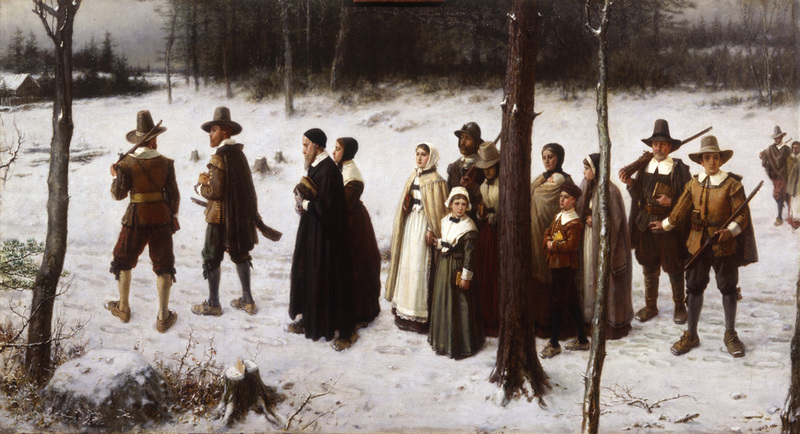 They dress like the puritans in russets, browns and other “sadd” colors, wear steeple hats, venerate their elders – the big change being that these pilgrims are ruled by their women rather than men. The Cavaliers: Inspired by the name of the class from Unearthed Arcana and by the identity of the Anglican settlers of Virginia and the Chesapeake, the cavaliers are dandies and monarchists loyal to Gloriana that are seeking to recreate Camelot in the Virgin Woode. Their names are based on the knights of Arthurian romance and the Faerie Queen and they adhere pretty closely to the feudal concept so common in fantasy games. 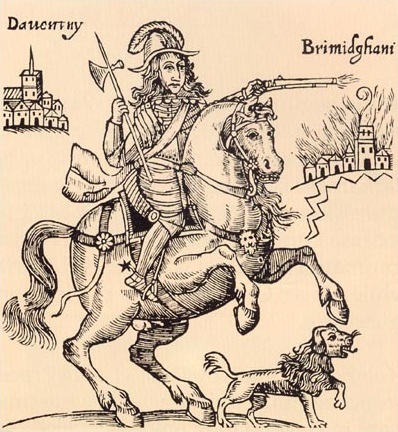 Like the real cavalier settlers of North America, they speak with a drawl (which originates in SW England – the Southerners of America didn’t make it up) and are all about gallantry, nobility, power, lust and a love of gambling. The Agitators: The agitators are the Son of Liberty in Dweomer Bay, determined to found a true republic and cast off the chains of monarchy. They’re devout worshipers of William Blake’s pantheon, especially of the Sons of Los, the gods of revolution. They’ve founded their own version of Penn’s Philadelphia, called Golgonooza. They’re recruiting an army and plan to cause trouble! A portion of the woods here is covered in an oil slick. 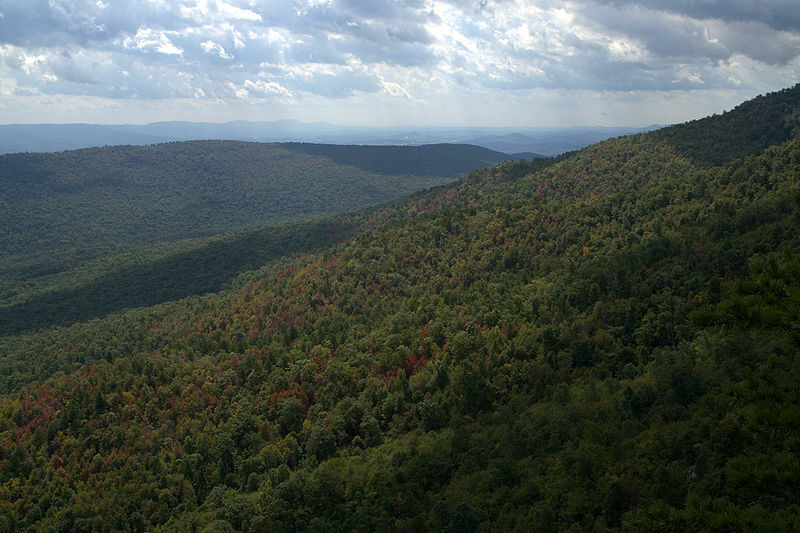 The slick covers about three acres; only thick, rugged grasses grow from beneath the slick, making the area it has blighted look like some sort of a unwholesome meadow. Those who touch the oil with their bare skin must pass a Fortitude save or be affected by a random magic oil. The remains of a walled city can be found in the swamp here. The ruins consist of nothing but crumbled walls and a few towers covered with slimes, verdigris or other forms of corruption. The ruins are haunted by an especially fierce skunk ape, who brooks no intrusions on his domain, and who is clever enough to pick off intruders one at a time. A flooded vault in the ruins holds a +2 scimitar that can slice through air. This has the effect of dealing double damage on gaseous and air elemental creatures, as well as allowing one to create small sonic booms by making a special attack against an Armor Class of 20. An ancient skraeling burial mound can be found here. The mound is about 200 feet in diameter and 22 feet tall. One side of the hill hides an entance veiled in illusion. Beyond this entrance there is a 80-ft. long passage lined by megaliths. At the end of this passage there is a teardrop-shaped shield painted a brilliant sapphire blue. This +1 shield is Lawful (CG) in alignment, and if touched by a member of any other alignment, sparks and causes 1d6 points of electricity damage (per round, if one keeps ahold of it). The shield is actually a door of sorts, a small passage being hidden behind it. The shield is wizard locked to the wall (by a 10th level magic-user). Beyond the shield and the small hole in the wall, there is a narrow set of stairs that lead downward through a brackish, powerful wind. At the bottom of the stairs (about 400 feet long, and sensitive folk might get the feeling they’re “not in Kansas anymore”) there is a crimson sea stretching out into a black expanse. Beyond the sea (how one crosses it is up to the players – perhaps canoes would work) there is a grey shore, a long strand of beach behind which there is a noisome jungle of scarlet foliage. A treasure has been buried on this beach by pirates of this strange dimension, a treasure of two golden tablets containing the location of the tomb of the Thief of Dreams. What monsters might dwell in this dimension, other than the pirates, is up to the TK – have fun and use it as a chance to surprise the players and introduce some new menaces. A clearing in the woods here holds an empty fountain made of red granite and topped with a coiled dragon made of tarnished copper. The dragon’s head is held aloft, such that one would assume that the water of the fountain would emerge from its snout. The pipe in the snout from which the water would emerge is currently blocked by the handle of a +1 light mace. The fountain is guarded by an astral deva called Morviel, placed here at the behest of a wizard of the ancient elves to keep the curious or wicked away from this Fountain of Holocausts. Should the magic mace be removed, the fountain would explode in a gout of blazing flame, one that would send white hot cinders flying through the air to land in the woods beyond. Anyone within 30 feet of the fountain, if active, would suffer 3d6 points of fire damage per round. Beyond 30 feet, and up to 1 mile, one suffers 1d6 points of damage per round. Naturally, within a short time the woods will be burning, causing other problems. 1) I read something and think that a particular character would make a good class. I usually look for something from classic fantasy literature, folklore or fairy tales, and a character type which spans a few different sources, even though one in particular might be the original or best known (i.e. there are lots of barbarians in fantasy stories, but Conan is the best known). It’s quite fun and old school appropriate to base a character class on a particular character from fantasy, including adding in quirks about that character – i.e. the AD&D ranger being able to specifically use crystal balls because Aragorn could use a palantir. If you want to do a “mystic knight” class, go ahead and make it the Luke Skywalker class and include a whining ability – inside jokes like that are integral to the origins of the hobby. 2) I come up with level titles. Seems weird to do that second, but if I can’t come up with eight or nine synonyms for the class, it probably isn’t based on a broad enough concept. 3) I think up one or two specific abilities that not only fit the character, but which set it apart from existing classes. I try not to just make a new class with a mix of abilities from older classes, though sometimes an existing ability is appropriate. 4) I next look for a similar existing class and use it as my base in terms of attack bonus, save bonuses, etc. I throw in the special abilities and then try to figure out how comparable it is to the existing class in terms of power to help me decide which XP chart to use. And that’s pretty much it. I try to keep in mind that I’m making up a bit of make believe nonsense for a game – i.e. I don’t take the process to seriously. Have fun. Be a little silly. By the way – Tanner Yea’s Races of Lore now joins his Heroes of Lore as a download on the Blood & Treasure page. The primordials are an ancient collection of dinosauroid species native to the jungles of Hybrasil. All are based on a pairing of an Aztec deity with a dinosaur, with a little magic thrown in. The quetzal are high-flying, arrogant pteranodons, the size of humans, who consider themselves the natural ruling class of the primordials. The others do not share this belief, but they are often content to ignore the quetzals rather than argue the point. They look like flying reptiles with rainbow-colored plumage. They have thin, long faces and rather impressive azure eyes. Quetzals are medium creatures with a movement rate of 30 feet per round on land and a fly speed of 30 feet per round. Because their bones are hollow, they count as small creatures in combat, in regards to tactical advantage and their ability to wield weapons. They have darkvision to a range of 60 feet. Quetzals fragile bodies impose a 2 point penalty to their starting constitution scores, but they enjoy a 1 point bonus to starting intelligence and wisdom. It’s not for nothing that they believe themselves the most fit for leadership among the primordials. These ability modifications cannot increase a score above 18 or reduce it below 3. Quetzals are as magically inclined as the other primordials. A quetzal with an intelligence of 10 or higher can cast the following spells, each once per day: dancing lights, flare and color spray. Quetzals speak Common and Primordial. They might also speak Couatl, Dragon, Lizardman, Sylvan, Troglodyte or Celestial. Quetzals may multi-class as cleric/fighters, cleric/sorcerers and cleric/thieves. The coyol are fearsome and frightening primordials. They have the appearance of velociraptors with milky white scales and pitch black feathers on their arms and tails. They have toothy grins and unwavering eyes that can bore a hole through a person’s skull (not literally). Coyols are small creatures with a movement rate of 40 feet per round. They have darkvision to a range of 120 feet. They have a bite attack that deals 1d4 points of damage. The coyols are like forces of nature, with boundless personalities. Their natural propensity to lead and their constant drive to get what they want gives them a +1 bonus to starting charisma, but this focus on ego also gives them a -1 penalty to starting wisdom. These ability modifications cannot increase a score above 18 or reduce it below 3. Coyols have magic in their blood, though this magic changes with the phases of the moon. When the moon is waxing and when it is full, a coyol with a charisma of 10 or higher can cast the following spells, each once per day: daze, light and hypnotism. When the moon is waning or new, they can cast darkness once per day. Coyols speak Common and Primordial. They might also speak Dragon, Kobold, Lizardman, Sylvan, Troglodyte or Fiendish. Coyols may multi-class as druid/sorcerers, fighter/sorcerers and sorcerer/thieves. Tezcats are large primordials, with scaly skin that forms a sort of armor plating on their backs, chests, faces and arms. They have squat legs, thick, armored tails and are almost as wide as they are tall. Their scales are turquoise in color and their faces have the appearance of turquoise skulls. Tezcats are warriors born, and relish taking the front line in any fight. Tezcats are large creatures with a movement rate of 20 feet per round. They have darkvision to a range of 60 feet and have a knack for breaking down doors. A tlaloc can make a tail attack in combat for 1d4 points of damage. Their armor plating gives them a natural AC 12. Tezcats are brutes, adding one point to their starting strength score. Their tiny heads and brains, however, don’t lend themselves to brilliance, so they lose one point from their starting intelligence score. These ability modifications cannot increase a score above 18 or reduce it below 3. Once per day, a tezcat can unleash a deep, long bellow that acts as a gust of wind spell. Tezcats may multi-class as cleric/fighters, fighter/sorcerers and fighter/thieves. Tlalocs look like humanoid toads with glistening, bright green hides and needle-like spikes running up their arms and down their backs. They have large, golden eyes that can show an incredible cunning when their owner wishes them to, but otherwise look blank and inscrutable. Two long fangs jut from their thin, crooked lips. 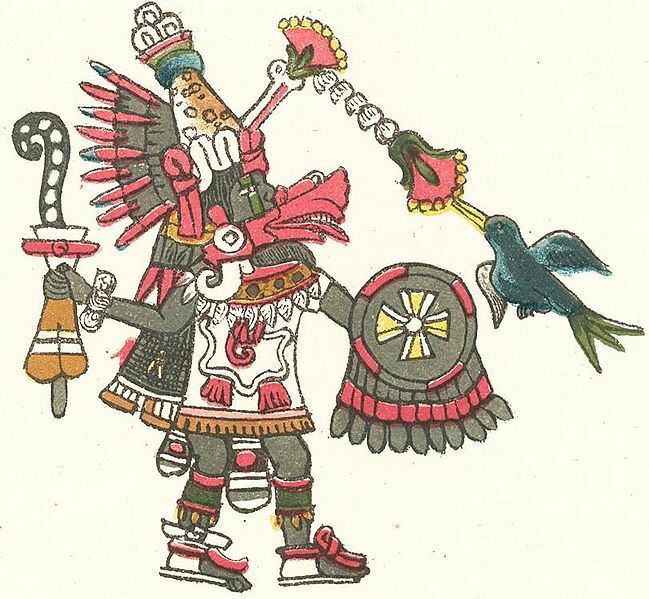 Tlalocs stand about as tall as dwarves, though this is partially because of their hunched postures. Tlalocs are medium creatures with a movement rate of 30 feet per round on land and a swim speed of 20 feet per round. They have darkvision to a range of 60 feet and have a knack for jumping and leaping. Tlalocs can hold their breath for a full minute before needing to breath. A tlaloc can make a bite attack in combat for 1d4 points of damage. Tlalocs are quick and cunning, adding one point to their starting dexterity score. Their foul personal habits and monstrous appearance gives them a one point penalty to their starting charisma score. These ability modifications cannot increase a score above 18 or reduce it below 3. 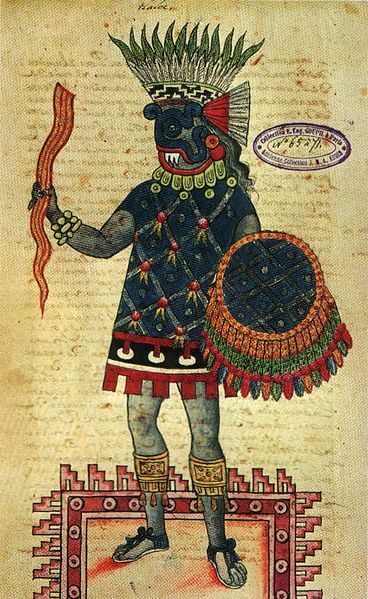 As a primordial species, Tlalocs have a natural affinity for and control over water. A tlaloc with a wisdom score of 10 or higher can cast the following spells, each once per day: acid splash, ray of frost and obscuring mist. Tlalocs may multi-class as cleric/thieves, fighter/thieves and sorcerer/thieves. In case anyone is unaware, the following class is based on my reading of the first few chapters of The Man Who Was Thursday, a “surreal” little volume by G. K. Chesterton about the fight between the Central Council of Anarchists and the poets who form the New Police Force. There are anarchists – the garden variety of folks who talk about toppling governments in the name of ultimate freedom, and back it up with a bomb or two, and there are the true anarchists, who look to a higher form of anarchy that cannot exist within the human (or, in fantasy terms, the humanoid) community. These fellows seek not the toppling of governments, but the toppling of humanity (or humanoidity – weird word, have no idea if it’s correct) itself. As this would be an unpopular tack to take among the living, the true anarchists face a great deal of opposition, and therefore must organize themselves, ruthlessly and efficiently, to achieve their goals. To this end, there exists a great organization of anarchists governed by a council of seven, each member of this inner council being named for a day of the week. All anarchists seek to rise to this council, but all anarchists must first start on the ground floor, advancing the byzantine aims of the central council in the world. Just as the forces of Law delve underground in search of treasure and magic to fuel their fight against chaos, so chaos must delve to match them. All of these bombs have a blast radius of 5 feet. An anarchist of higher than 1st level can choose to sacrifice one dice of damage to increase the radius by 10 feet. Anarchists have their own secret language, in the manner of the thieves’ cant. Called the “black tongue”, it is, more than anything else, a gobbledygook of quotations and dialectics. With their bombs and their secret tongue, anarchists are sent into the world to work the will of their shadowy masters. To this end, they are given instructions that must be carried out – instructions they will rarely understand, so dark and brilliant are the workings of their president. Before each adventure begins, an anarchist receives a random instruction. If it is carried out, the anarchist earns an additional +10% earned XP. If the anarchist fails at his mission, he loses 10% of his earned XP. A 3rd level anarchist is capable of unleashing a raging oratory that works in some ways as a bard’s ability to fascinate sentient creatures with his music. Those within the sound of the anarchist’s voice must pass a Will saving throw or suffer under the effects of the rage spell and vent their spleen upon the nearby symbols and agents of authority. Lawful individuals enjoy a +6 bonus to save vs. this effect, while chaotic creatures suffer a -3 penalty to save against it. A 5th level anarchist possesses a madman’s sense of purpose and certainty. By taking a swig from their ever-present flask of brandy, they become immune to fear and magical persuasion for 1 round per level. A 9th level anarchist may build a hideout beneath the streets of a major city, hiding within it a vast armory of weapons and bombs, and attracting to him or her 1d6 rogues per level, 1d6 first level anarchists who wish to learn from the master and a 3rd level anarchist to serve as his or her lieutenant. Once an anarchist has a hideout, he or she is eligible to be elected to the central council, gaining a random name from Monday to Saturday. 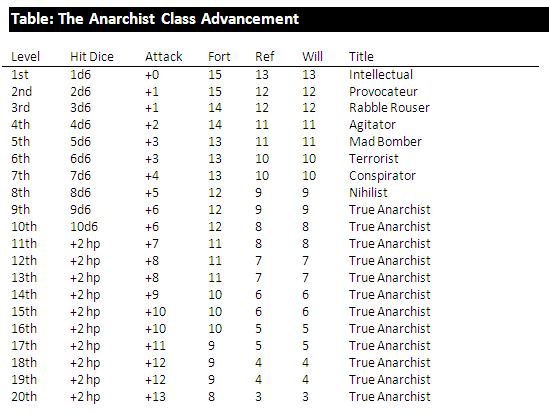 Each game month, there is a 1 in 20 chance that a sitting member will die and must be replaced, and the anarchist has a percentage chance equal to his level of being named to the position (with bonuses for any clever campaigning the anarchist does). A similar chance exists for anarchists already on the council to assuming the presidency of the council and taking the name Sunday. I’m three chapters into G. K. Chesterton’s novel The Man Who Was Thursday, and I’m loving it. I was wavering through the first chapter until the last few lines. Now I’m completely hooked. Imagine if you will the turn-of-the-century struggle between the Central Council of Anarchists and the poets-turned-police officers assembled to stop them from destroying the world. If you’re into the weird and absurd, you will probably dig The Man Who Was Thursday. And since the inspiration has struck, I will be presenting, tomorrow, the anarchist class. That’s all for today kiddies! Several ceramic urns, glazed bright red, have been buried here in a shallow hole; a glint of the sun might reveal them as folk pass by (1 in 6 chance). Most of the urns hold nothing but ashes, likely the remains of living creatures. One contains eleven agates of various hues (worth 1d4 x 10 gp each) wrapped in an ocherous cloak. The cloak is magical and cursed, steeped in the blood of a pyrohydra and spat upon by a woman scorned. When worn too near a large fire (campfire size or larger, and yeah, fireballs count), it bursts into flames, burning for one minute and dealing 1d6 points of damage per round. Only after a person has burned in it can they attempt to remove it, the effort still requiring a Will saving throw. A cavern in the mountains here is serving as the temporary base of operations for a band of scouts from the shadowy Dimension X. The scouts are humanoid, but their features are obscured by their protective suits, which are formed of a silvery cloth. These jump-suits are loose fitting, and cover the entire body. Over their heads, they wear globes of silvery metal with dark visors. These helms and suits cannot be removed save by the most dire force. If removed, they reveal the humanoids within look like normal humans, save for their eyes, which are entirely black. The ten scouts are usually found hovering around a column of black metal decorated with dials, knobs and blinking lights of many colors. This device not only opens a portal into their home dimension, it also collects information about the surrounding lands and can project a wall of force for up to 10 minutes. The scouts carry ray guns (6 charges each; they can be recharged by placing them on the column for 1 hour) that fire beams of negative energy that deal 1d6+1 points of damage per hit. The presence of the scouts and their weird device are causing the weather in this hex to behave oddly; each hour, there is a 1 in 6 chance of severe weather (lightning storm, hail, high winds). Cathron is an ancient elf, a victim of Asur’s curse who was turned into a drow. She did not leave her stronghold, but rather enmeshed it in demonic energies. The stronghold appears as a 200-ft. tall tower of smooth, scarlet stone that writhes with black, choking smoke and drips with demonic ichor. One only enters the place by teleportation. 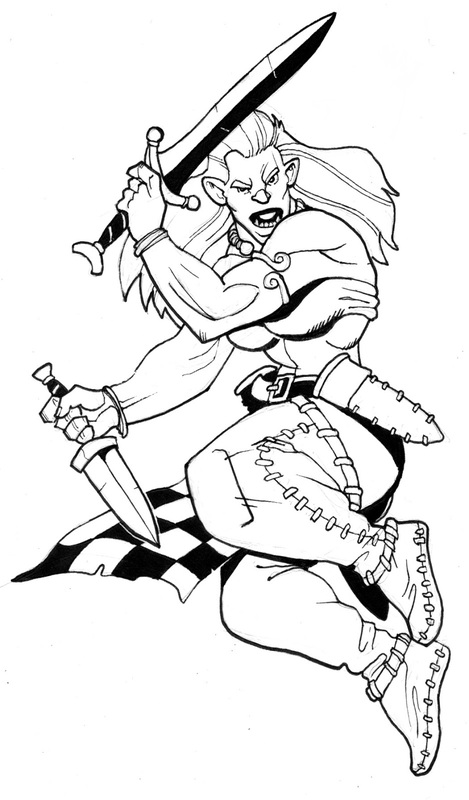 Cathron is a lithe, athletic drow with silvery hair and tempting eyes. She is a born deceiver, and is quite incapable of love, though that has not disuaded Finnard  or Lowellon  from attempting it. Within the tower, Cathron is served by a company of fiendish lizard men with glistening black scales and blazing eyes. Her treasure trove is guarded by a young red dragon, Thartwalla, who also serves as her mount when she leaves her tower.